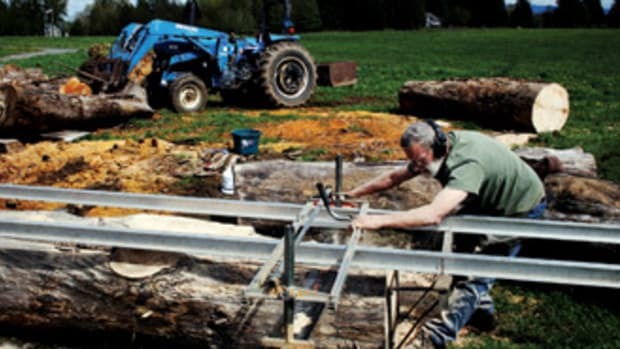 Though Rob Grant loves his big equipment — Omnitech CNC, Whirlwind saw, Brandt edgebander — there’s a smaller tool he uses to run his cabinetmaking business: a multi-lens digital camera. Creating a picture-perfect image is vital for any company and Grant, president of Contemporary Woodcrafts, does it largely with snapshots and labels to match. 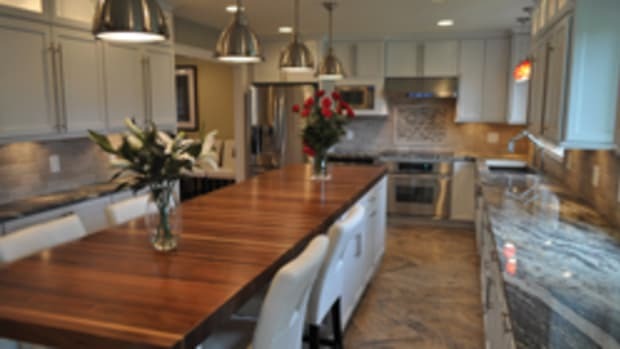 Go to www.cwcabinet.com to see hundreds of photos that help motivate prospective customers to make their buying decisions. Step into the company’s showroom in Chantilly, Va., to see screens projecting pictures, albums resting on sleek built-in cabinets and walls lined with framed photos. They’re all clear, studied, informative shots that chronicle the company’s output and 28-year history. His audience lives in an area densely populated with millions of educated, affluent homeowners, mainly in metropolitan Northern Virginia and Washington D.C., where competition lurks around every corner. The premise behind Grant’s video blitz has a lot to do with exposing his company. People tend to remember pictures better than words, especially if they’re plentiful and thoughtfully distributed. 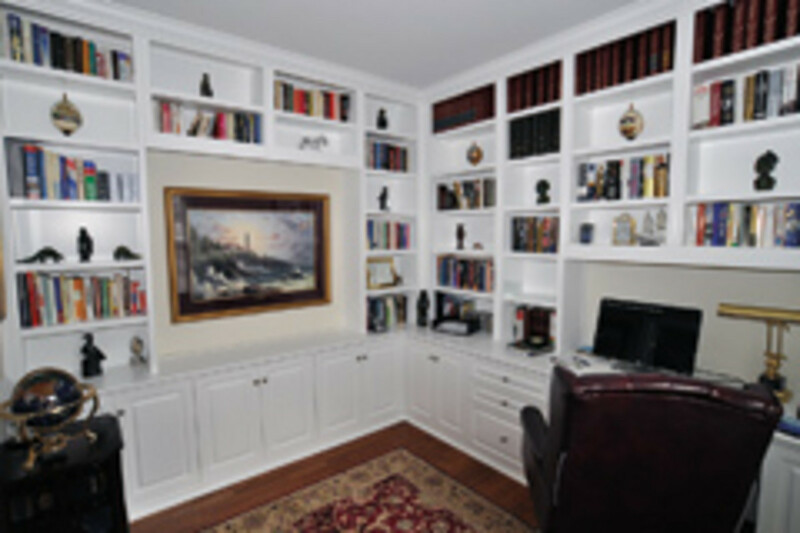 The company designs and manufactures two cabinet lines that define the construction methods for all its cabinet products: CW Express bookcases and built-ins are semicustom-tailored to fit to 1/16”. Sides, tops and bottoms are 3/4-inch-thick. Shelves are 1-1/2” thick to prevent sagging. 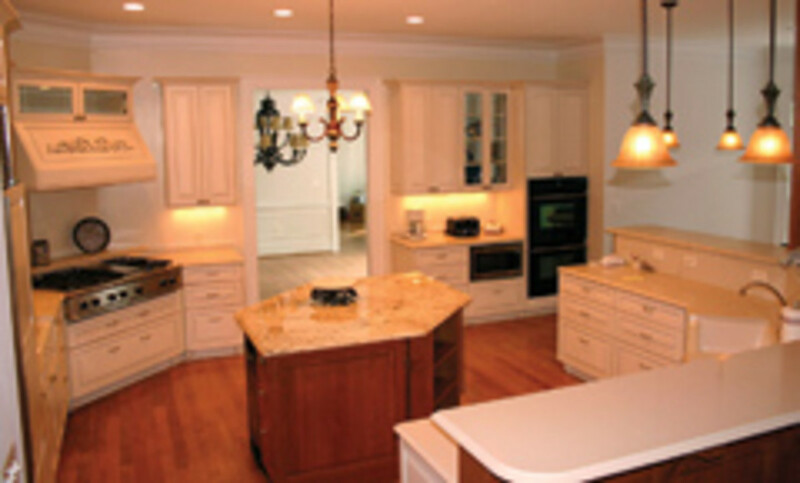 Construction style is frameless bases and face-frame inset upper cabinets. There are several finish choices — white or pastel to match existing woodwork or stain and lacquer finish on cherry, maple, oak and mahogany. In addition, there are many hardware, molding and door selections. All cabinets in this line are installed by the company. 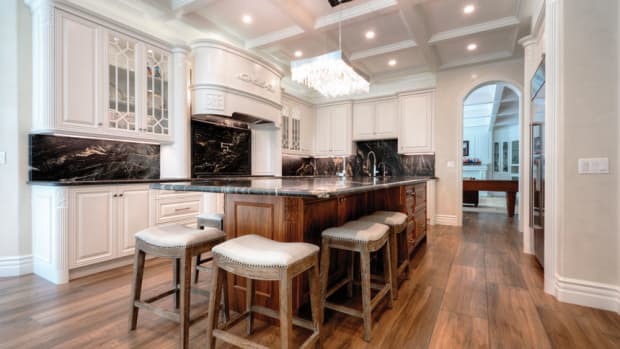 The PotomacWest Collection is composed of cabinets for kitchens, closets, baths and bars and installed by unaffiliated building contractors (with the exception of closets). Special features include four-point base levelers to keep cabinets off the floor and removable toe kick to allow cleaning and access beneath; wood dovetailed drawers or the popular European-style metal-drawer box systems with soft, self-closing, concealed slides, a multitude of finishes and hardware choices, and easy-to-clean white or maple melamine interiors. Grant’s responsibilities as owner and president are wide-ranging and break down into four major categories: marketing; on-site measuring and monitoring; watching cash flow; and generating new products and production ideas. 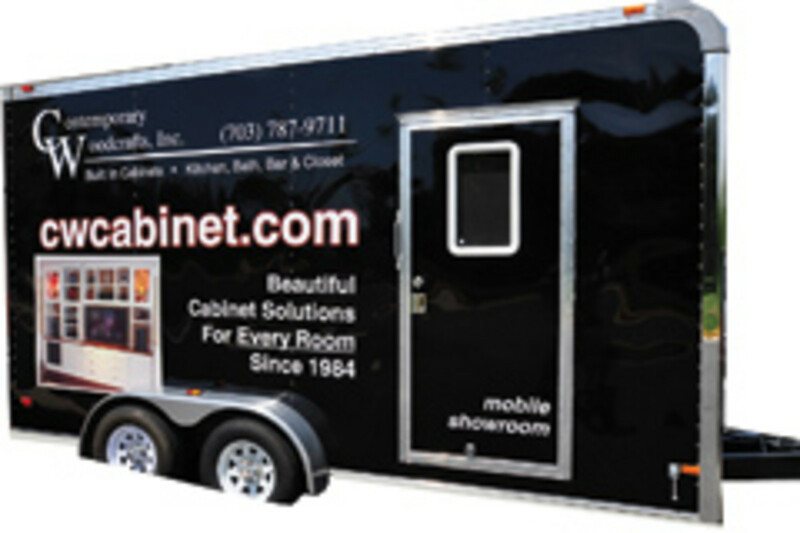 A mobile showroom is an example of one of Grant’s innovative ideas. It’s a modified custom racecar trailer hitched to a GMC Yukon hybrid SUV. The interior is decorated like an entertainment room with prototype built-in cabinets and video screen displays. 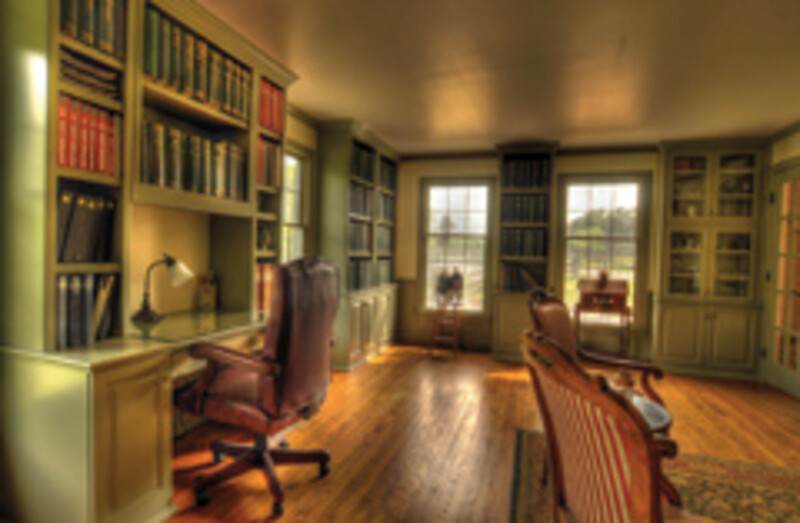 Grant uses his exceptional organizational talents in dispatching his self-appointed duties. He runs his company much like he’d run a classroom — with disciplined order and attention to details, especially cash flow. One way he maintains control is through the use of manuals. Like equipment instruction books, they provide valuable written guides. His business operating manual begins with an organizational values statement, covering four values geared toward giving customers high product value for their money and constantly monitoring and improving quality and production techniques. He also wrote a manual for contractors, providing detailed specs for all his company’s products. Dealing with every type of customer from the unreliable to the temperamental inspired him to rewrite the buyer’s contract. It used to be a simple one-pager. Now it’s an extremely detailed 15-point agreement. Grant grew up in Long Island, N.Y., so all he’s ever known is the hustle and bustle of city life. His father was a businessman and inventor who patented, manufactured and installed car-washing systems. Grant accompanied his father on inspection rounds, learning the fundamentals of business development and management. He got his initial taste of woodworking in high school shop classes. At the State University of New York in Oswego, he graduated with a degree in industrial arts/education. For two years, he taught industrial arts to eighth graders in Richmond, Va. His lessons were lost on restless, often disruptive adolescents. When low pay and discipline problems took some of the joy out of the classroom, he moved on to a good, but boring, desk job in defense contracting. 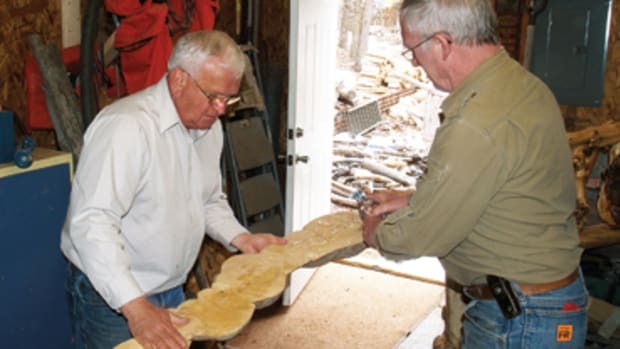 Along the way, he also taught adult education woodworking classes, which he loved because, unlike his middle school students, his mature scholars paid for their courses and were motivated. Though Grant lauds formal education, he’s also gleaned knowledge on his own from personal reading. He gained admiration for Steve Jobs’ visionary inventions and drive after reading the recent biography on the Apple co-founder. Eli Goldratt’s novel, “The Goal,” gave him an expanded insight into operations management procedures, some of which he employs. Though Grant made good money at previous jobs, he was never satisfied. Either he was not challenged or didn’t have enough independence. When the exhibit fabricator enterprise laid him off, he came to a reckoning point. Should he seek employment with another company or try something on his own? He needed an outlet for his energy, something to stop his spinning wheels. Perhaps he could mine his persistent love for tools and woodworking. One day in 1984 he took the first step. 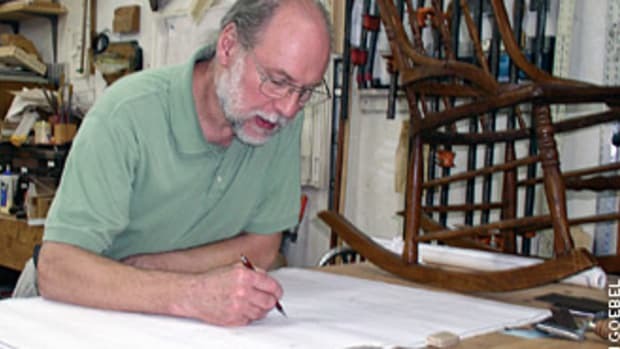 He went down into his 120-sq.-ft. townhouse basement and with a power saw and a few hand tools, began to make wood items: chairs, tables and cradles. He displayed at craft and home shows as Contemporary Woodcrafts. Then he had a bright idea. He would design “The Jewelry Closet” along with a marketing plan and unique packaging — an attractive item that would be in demand. But the experiment netted disappointing sales. He completed the bookcase, assembling it outside for lack of space. And that was the start of a bigger and better Contemporary Woodcrafts. 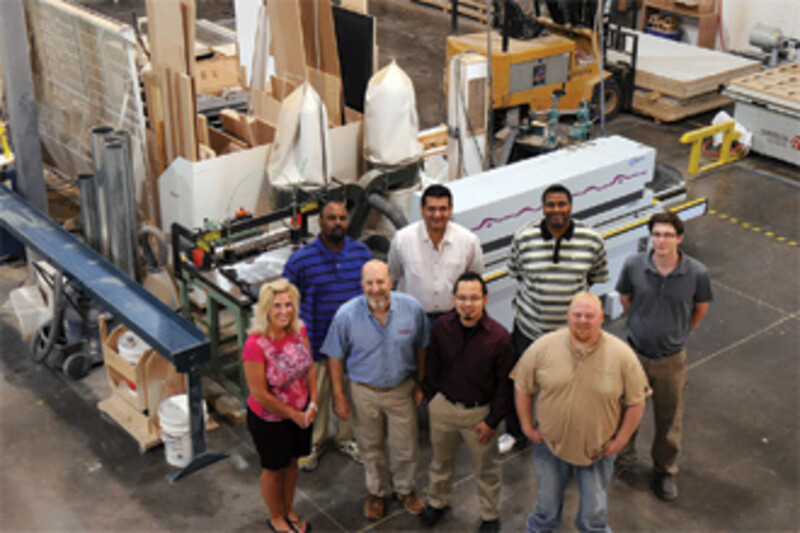 In 1987, he incorporated and began full-time residential cabinetmaking and installation. 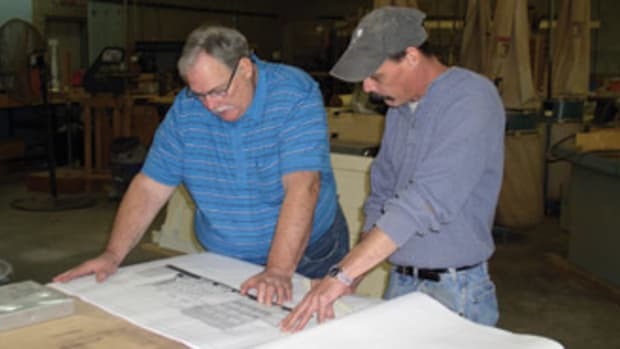 Through slow, progressive growth, he moved to three other shop locations in Virginia before settling into his present and largest facility six years ago. 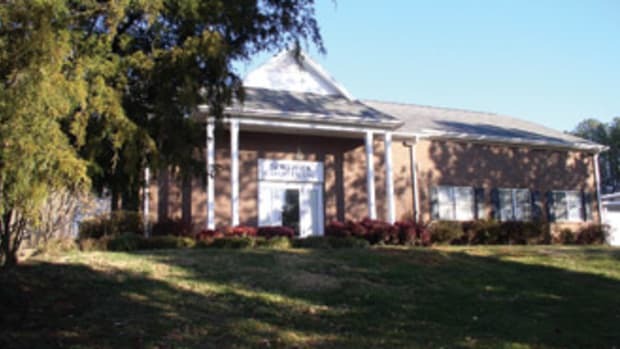 In 2005, Grant purchased an end unit condominium, zoned for commercial use. He designed the 8,000-sq.-ft. facility using experience in previous shops to determine the configuration and details. The first floor is allocated for reception area, showroom and the shop. The upper level is divided into three offices. The entrance to the shop is from the kitchen area through double doors. In his former workshops, seeping dust polluted the air, clogged telephones and computers and left layers on all office surfaces, so he made sure the two-door setup was part of his design. Motion-sensor and fixed-time light switches were installed along with sodium bulbs in the shop’s vaulted ceiling. The facility came with 440 voltage, which is housed safely behind a wire fence. However, a portion of the current is reduced by a step-down transformer to 220, which some of his equipment requires. For environmental reasons, Grant has been utilizing waterborne finishes for more than 20 years. He now uses only M. L. Campbell products in the spray booth to eliminate air contaminants and vapor masks. Sitting at the ready is a forklift, battery-generated instead of propane to eliminate air pollution. The sequential cabinet production is done in a neat U-shaped path beginning at the drive-in supply bay and ending with a loading dock. The manufacturing route takes materials to the CNC router, various saws, edgebander, Williams & Hussey molder, Conquest horizontal boring machine, Col-Met walk-in spray booth with air makeup system, Grass Zargen drawer box system, Hafele Moov-IT drawer box system, Salice hinge system, Sand Pro dust-free sanding station. In addition, there’s a 7.5-hp dust collector system with individual collector units at each machine. Everything is streamlined to minimize movement of materials and employees. Key personnel are Juan Roberts, Benton Chrea and Kelli Koutstaal. 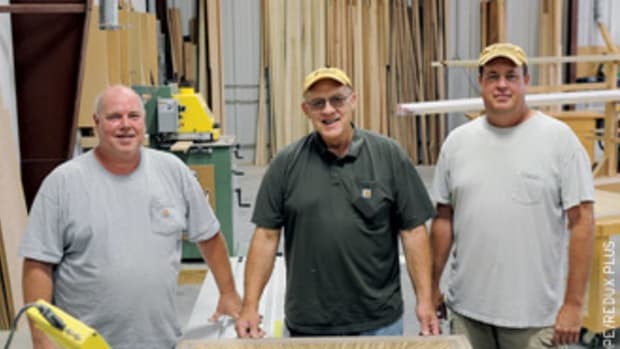 Roberts, the shop manager, came to Grant from the carpentry industry more than 20 years ago. “His wonderful disposition and positive attitude help more than anything to keep up the morale among all my workers,” says Grant. Koutstaal lends a friendly face to the organization and greets the public as they come through the door. She’s the phone-answering service, multitasker and bookkeeper all in one. Every employee performs housekeeping duties on a rotation schedule. Hours are 7 a.m. to 3:30 pm. Monday through Friday. The work time was established to beat the heaviest rush hour traffic and cater to the building industry. Everyone is granted some slack for occasional family responsibilities, traffic or emergencies. If they wonder exactly what’s expected of them, they go to Grant’s standard operating procedure manual with bulleted entries. Grant counts himself lucky to have a reliable and congenial staff that makes it all happen. It’s dealing with stressed clients and setting up meeting times around their jobs, soccer games and parent-teacher conferences that challenges him. So when the appointment is finally made and the deal closed, he might enjoy a brief getaway to the wharf, camera in hand. He unties his boat and floats out into Chesapeake Bay or the Potomac River and finds fresh wind for his sails, a pool of fish for his line. And he’s sure to call that a fine day.